Esther Victoria Abraham (1916-2006) was born in Calcutta, India to a wealthy Iraqi-Jewish family. Although she studied at the University of Cambridge to become a teacher, her passion was acting. Her first gig was dancing for a Persian theatre company. From there, she made the jump to Bollywood, and went on to star in 30 films under her stage name Pramila. Following India’s independence in 1947, she won the country’s first Miss India beauty pageant. Pramila was also one of India’s first female film producers, making 16 movies under her own Silver Productions company. Interestingly, her daughter won the Miss India contest in 1967, making them the only mother-daughter duo to win the pageant. Her son continues to be a popular Indian TV and film star today. Pramila’s fellow Iraqi-Jewish actress was Ruby Myers (1907-1983), born in the city of Pune. Myers was working as a telephone operator with no interest in film when she was discovered by a director. She initially turned down his offers but ultimately relented when he kept pursuing her. 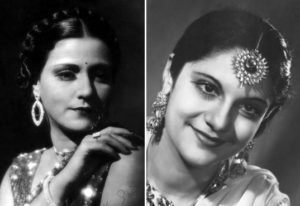 Despite having no formal training in acting, Myers soon became India’s biggest and highest paid actress, going under the stage name Sulochana. Incredibly talented and versatile, in one 1927 film she played eight different roles! She was so popular that when Gandhi was struggling for India’s independence, he used an image of Sulochana in his campaign poster. She went on to start her own production company, too, called Rubi Pics. Becoming very wealthy, Sulochana drove the first Rolls Royce in India. In 1973, she won the country’s most prestigious cinema honour, the Dada Saheb Phalke Award, and in 1983 was featured on an Indian stamp. Be mild in speech, suppress your anger, and always strive to be on the best terms with your relatives and all people, even with the stranger in the street, so that you may be beloved Above and well-liked below and be acceptable to all of your fellows. This entry was posted in Arts & Entertainment and tagged Baghdadi Jews, Beauty Pageant, Bollywood, Calcutta, Cambridge, Dada Saheb Phalke Award, Film, Gandhi, Indian Jews, Iraqi Jews, Jewish Actresses, Miss India, Pramila, Pune, Rolls Royce, Sulochana on May 23, 2018 by Jew of the Week.